I decided to do it as a graduation gift for my brother who graduated from Abilene Christian University on May 6, 2000. 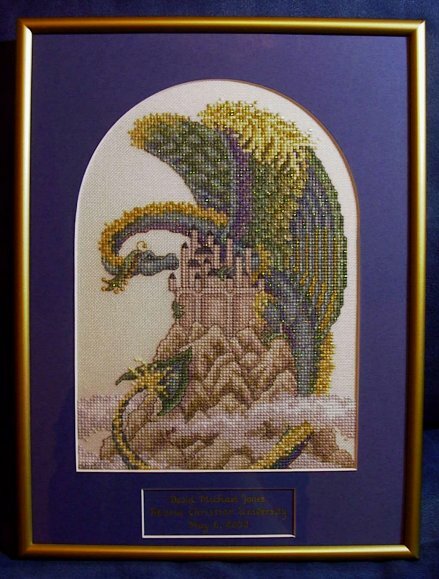 I remembered that graduating from college felt like the dragon finally reaching the castle high above the clouds. (That, and I still felt slightly guilty that I had originally intended The Castle to be his and ended up keeping it for myself.) I felt I owed him a similar design. The piece was stitched on 28 ct. Antique White Joblean. I added Prisms P-1 to the dragon and added a nice sparkly scaly look. The framing was done by Dan Melvin of Matte Ink who was very patient with me. He gave me his sample matte to take home and do the calligraphy while we were waiting for the actual matte to be shipped. When it arrived, he cut out a square and slipped the matte with the information on underneath. It is so great to have a framer who is willing to work with you with strange requests!